The Life and Times of Musical Theatre in Finland, part 2/4. Read this part in Finnish here. In the second part of the series, the focus is on completely Finnish musicals. Though Finns also enjoy Broadway shows, many of our most loved musical productions have been written and composed in Finland. And did you know Finnish musicals have been imported all the way to China? “The performance itself hits a record low”, theatre critic Toni Lehtinen described the most popular Finnish musical production ever (Turun Sanomat 9.9.2006). Vuonna 85 – Manserock-musikaali or In the Year 1985 – “Manserock” the Musical premiered in Tampereen Työväen Teatteri in September 2006. “Manserock” is a term for rock music with Finnish lyrics from Tampere, Finland’s biggest inland city. The Manserock genre was especially popular in the 70s and 80s, and Vuonna 85 was based on well-known hits from the era. Listen to the song the musical was named after. Theatre critics didn’t much appreciate the show, finding faults in nearly every aspect of the production. The audience, on the other hand, absolutely loved it. The musical ran for six years and was performed for over 400 times. Almost 300 000 people saw it. The city of Tampere has about 220 000 inhabitants, so you could call that a success! Vuonna 85 is the most popular Finnish musical production of all times, and Tampereen Työväen Teatteri states it’s without a doubt the theatre’s most successful production ever. The musical’s plot was built around hit songs and even the characters’ names were all picked from lyrics. The story, set in the 80s, revolved around a pair of lovers who lost touch and spent a summer trying to find each other from rock festivals. When they finally met each other again, it turned out the lady had found a new love – the man’s best friend. During its six years in the theatre’s repertoire, the Manserock musical had three different endings. At first, the woman stayed with her new love, later she left him for her summer sweetheart. In the third ending, she ditched the both and joined the army. “Vuonna 85 was a fun show, but I believe that it also touched people. Many were surprised to find out how moving the musical was. People often denounce musicals as light and mindless entertainment, and on top of that, this one was a comedy… But many people found themselves crying during the show”, actor Jari Ahola describes. Party like it's 1985! A scene from the Manserock musical. Vuonna 85 had lots of devoted fans. Many of them saw the musical dozens of times. Audience members dressed up in the style of the 80s. There were fan meetups, meetings with the actors and 80s theme parties. From the theatre’s souvenir shop, audience members could buy cast recordings, karaoke DVDs and even Manserock themed board games. “It was great to see the show having fans who enthused about their favourite characters. That’s quite rare in theatre. In a way, with this musical, you could pretend to be a rock star for a while”, Ahola, who played one of the musical’s leads, says. “The fans dressed up as the musical’s characters, and sent us plenty of gifts. All sorts of teddy bears, clothes, perfumes and drinks – and once, I even received a pair of men’s underpants. An unused pair, though!” he laughs. 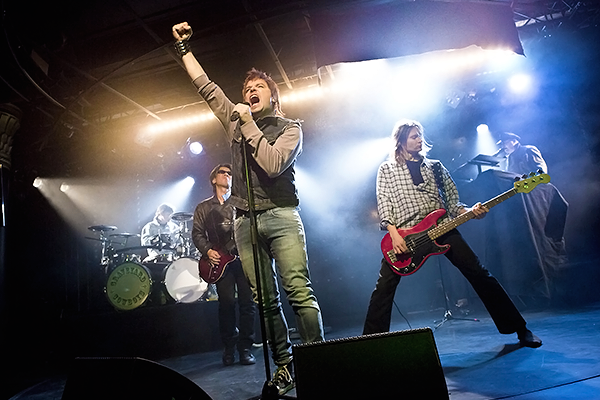 During the six years in the theatre’s repertoire, the musical was fine-tuned multiple times, resulting in revamped versions called Manserock the Musical Remix and Manserock the Golden Turbo Platinum Edition. What’s more, there were sing-along performances and a spinoff musical featuring some of the original’s characters that was performed in a nearby outdoor theatre. The musical was also adapted for film. It was one of the most popular Finnish movies in 2013, but its success pales in comparison of the live musical’s nearly 300 000 watchers: the movie was only seen by 160 000 people. Whistle while you work. Hard labour in the style of Vuonna 85. In December 2012, Vuonna 85 was performed for the last time. But Tampereen Työväen Teatteri’s big success is far from forgotten. Nowadays Mauno Peppone, one of the main characters from the musical, has his own solo musical Mauno Peppone − elämä, kuolema ja comeback. The new show has been in the theatre’s repertoire from January 2014. The most enthusiastic fans have already seen the sequel dozens of times too. In Vuonna 85, Mauno Peppone was a young machine factory worker who dreamed of being a rock star. By the end of the second act, his dream came true. The solo show takes place in the middle of the original. Mauno falls asleep after a long day at work and dreams of stardom. 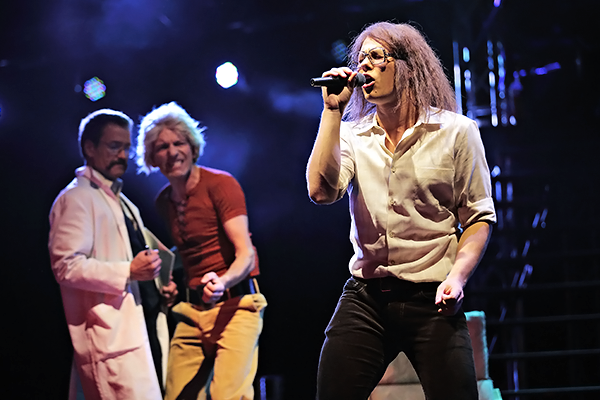 In the sequel, the soundtrack isn’t fully Finnish anymore – instead, the history of rock gets rewritten during the show. “I’m incredibly grateful to have experienced a success like this. I’ve put Mauno’s shoes on on nine autumns in a row. It’s not often you get to test how a character grows during the years like this”, actor Jari Ahola says. So far, there’s no end in sight for Mauno Peppone. “Judging from the standing ovations, the audience seems to really like the show. Hopefully we’ll get to perform it for a long while”, Ahola wishes. Jari Ahola as Mauno Peppone, performing with Alabama House Band. Sweden is another of Finland’s official languages, and about five percent of Finns speak Swedish as their native language. Therefore there are some Swedish-speaking theatres in the country. Svenska Teatern in Helsinki is especially known for their musicals. In 1994, Svenska Teatern premiered Hype the Musical, a show aimed at young people. It was a hit. The premiere audience applauded the show for fifteen minutes and the musical’s songs were even played on the radio. Listen to one of them here. After fifteen years, it was again time for Fenno-Swedish musical production for young theatregoers. Svenska Teatern’s brand-new PlayMe the Musical was premiered in autumn 2009. PlayMe is a story about a boy who creates a virtual reality, and a girl who wants to become a star. The two meet each other when the girl gets lost in the virtual world and the boy has to save her. “The story also features a media mogul. He produces talent contests in the style of American Idol. The musical’s plot interconnects online worlds, dreams of stardom and abuse”, director Maria Sid describes the story. “We wanted to make a new pop musical. Besides Hype, there haven’t really been any in Finland”, Sid tells about PlayMe’s creation. The production searched for new talent both onstage and outside the theatre. 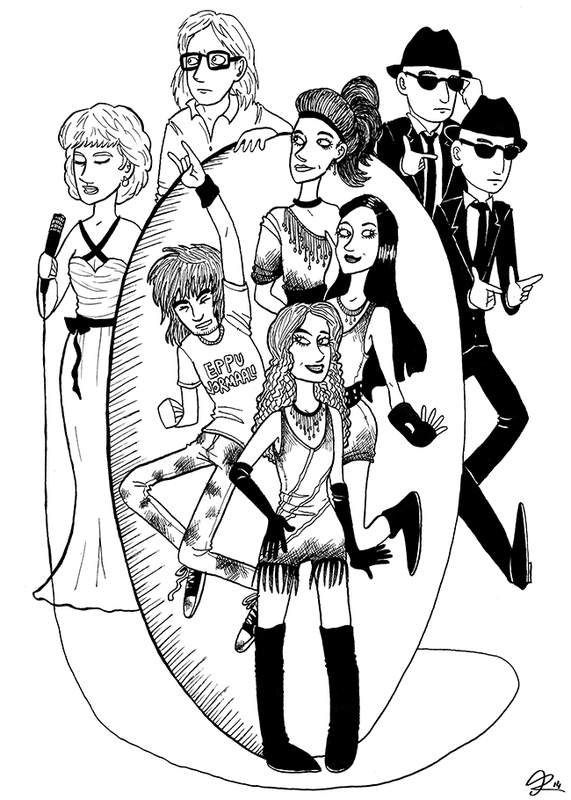 Ten members of the musical’s cast were found via an online talent contest. The competition continued in the theatre: during the intermission, the audience could use their cellphones to vote for their favourite performance. “In the beginning of the second act, it turns out the media mogul doesn’t care about the vote at all. Instead, he does what he wants to. I wanted to show the audience what the truth behind television’s talent contests is”, Sid says. A scene from PlayMe. Photo: Cata Portin. In the 90s, PlayMe’s predecessor Hype was performed for two years and seen by over 100 000 people. In its turn, PlayMe only ran for one season and for an audience of 40 000. But that wasn’t the end of the musical’s story. Instead of Finnish stages, the show has found new audiences abroad. In 2012, PlayMe premiered in Theater Chemnitz in eastern Germany. The show was produced by a German crew but according Svenska Teatern’s original concept. Some of the cast was again found via online auditions. In 2013, PlayMe left for a Chinese tour. Director Maria Sid, choreographer Reija Wäre and light designer Joonas Tikkanen traveled to China in late 2013. They worked on a new production with performers from the South China Song and Dance Ensemble. In December 2013, PlayMe started touring the biggest Chinese cities. “The Chinese don’t know how to produce musical theatre like this. Besides buying the rights to the musical, they wanted to employ the original creative team to work on the production”, Sid explains. In China, the online auditions were scrapped. Besides translating the Swedish lyrics into Chinese, the text was modified to fit local tastes. Sid says the Finnish musical fits Chinese culture well. A moment from PlayMe's German production. Photo: Theater Chemnitz. The most popular Finnish musical production ever, Vuonna 85, was a jukebox musical. All of its songs already existed before the musical was written. 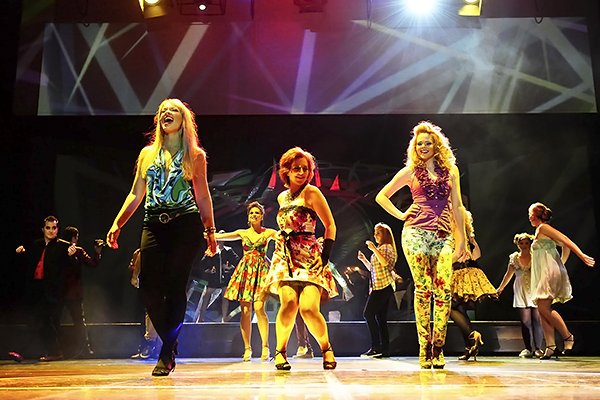 Even though many musicals with all-new music are staged in Finland every year, jukebox shows are especially popular all around the country. Musical plays that retell a famous artist’s life story through their hits are often produced in Finnish theatres. 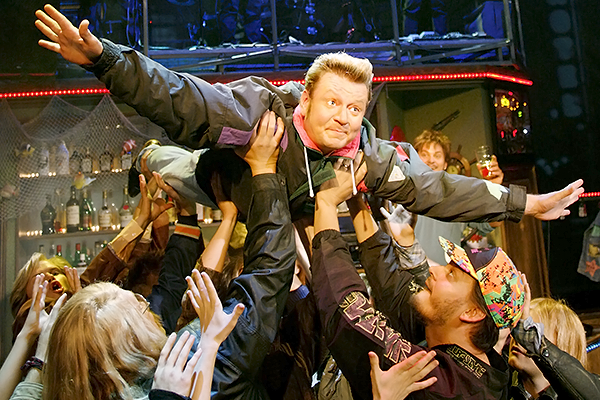 Dozens of Finnish stars have their own musical. One of these stars is Rauli "Badding" Somerjoki. Somerjoki was a popular singer-songwriter who, suffering from long-time alcoholism, died as a 39-year-old. Listen to one of his best-known songs here. Last autumn, Vaasan kaupunginteatteri premiered Badding − rokkiin ja takaisin, a musical about Somerjoki’s life. “It’s incredible how such an ugly life can leave behind so much beauty”, theatre manager Erik Kiviniemi summarises the musical’s theme. Vaasan kaupunginteatteri’s musical is new, but it’s not the first time Somerjoki’s tragic story has been told onstage. Another musical based on Somerjoki’s life premiered in Tampere at the same time as the Vaasa production, and there have been many different versions before these two. During its first season in the theatre’s repertoire, Vaasa’s version has proved to be a hit. Kiviniemi believes that despite all the musical adaptations, there are still stories to tell about the popular musician’s life. Kiviniemi says a jukebox musical is perfect for Vaasan kaupunginteatteri, a middle-sized theatre on Finland’s western coast. (played by Oiva Nuojua) on the right. Photo: Jyrki Tervo. Source used: Satu Räty-Tuominen: Vuonna 85 Manserock -musikaalin lyhyt oppimäärä eli menestystekijät ilmiön takana. Superinteresting! Thank you! I had no idea Vuonna 85 was so immensely popular and now I'm really sad I never saw it! I'm gonna keep on reading your blog! Thank you – and I'll definitely check out your blog, too!